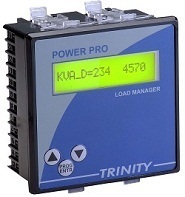 The Power Pro from Trinity is an easy-to-use, cost effective electrical power meter that offers all the basic measurement capabilities required to monitor an electrical installation. In addition to measuring the instantaneous parameters, it also measures accurately all three energies, and also demand, thus helping to measure and control energy costs. Over the basic metering, it optionally provides two relay outputs, RS485 port supporting MODBUS RTU protocol, dual source metering and THD measurements. All parameters with default accuracy calss 1.0s. Compact 96 X 96 X 55 mm DIN enclosure. Optional RS-485 port for connection to SCADA/EMS. Supply Auxiliary Supply: 90 - 480 VAC, 50-60 Hz. Output Relay Two. Individually Field Programmable. Expected Mechanical Life: >10 x 106 switching operations. Expected Electrical Life : >4 x 106 switching operations. TRINITY ENERGY SYSTEMS PVT. LTD. was founded in 1993, with the aim of being an indigenous provider of state of the art equipment in power factor and power/energy management. The company has grown from strength to strength, and consistently focuses on product development to keep apace with the changing market requirements.